In some of previous posts on inchoo.net, colleague of mine – Branko Ajzele wrote about extending Magento API – v1. Let say that mine extension is called: Inchoo Mapy and I will extend the customer API V2 first. Although Magento has pretty rich set of API calls, in my project I found that some of the API calls should be extended to fit our project needs. In later posts I will write about that specific needs and possibilities, but now let’s concentrate to extending core API V2 first. We should take in consideration that if we extend something with same API call name, we are not nice to other installed extensions that use core API too, so we will extend the core API, but let’s add new API calls to not interrupt core API maybe needed by other peoples extensions installed. After we defined our rewrite(s), let’s create V2.php like you can see in folder structure – in fact, let’s copy V2 file from: core/Mage/Customer/Model/Customer/Api/ and paste it inside our folder structure and make some changes. We have more steps to do: we need to add our api.xml file inside our etc folder, where our API calls will be defined, and we also have to define two more files: wsdl.xml for soap and wsi.xml to acoomplish possibility for client side to generate client source code from our definitions. Now just grab the wsdl.xml files and wsi.xml files from core/Mage/Customer/etc and edit them to suit your needs: add new API calls, extend existing complex types definitions etc, and Magento will load and merge all of these files with appropiate core files. When you are going to auto-generate web service’s client classes, don’t forget inside admin area to change WSI compliance to : yes and reurn to no when you are ready to consume web services. Darko, great post! thank you! I’ve tried to get custom attribute using catalogCategoryInfo function in SOAP2 and I got a problem here. 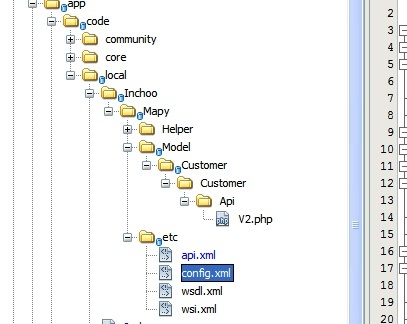 It exists in Mage_Catalog_Model_Category_Api_V2->info function – I ckecked that. And I added to wsdl.xml into section. But I still cannot get custom attribute. Don’t you know why it doesn’t work? Brilliant article . I did one by one and it works on Magento Community 1.6 . I did not touch play with WS-I . Only one thing I have twice Customer on Role section ACL. However , I will fix it . Oh, I’ve been extensively working with the API since 1.3 and I’ve gone through many of the problems related to proxy generation with the V2. In fact we have a whole product solely dedicated to the Magento API and we need to support it on a daily basis. I was not drawing any conclusions in my comment above except that your last paragraph doesn’t make sense to me. You are suggesting to turn on WS-I when auto-generating a proxy and then later turn it off when you want to consume it, right? –> This doesn’t work, because the proxy that gets generated from the WS-I enabled mode is _not_ compatible with the V2 in non WS-I mode. There are some differences and you simply can’t interchange a proxy between this two modes. Darko, thanks for this post. In your last paragraph you’re suggesting to turn of WS-I compliance after the proxy has been generated. Is there any particular reason, why I would want to do so? Without context, this actually sounds pretty bad to me…? Has anyone managed to get this working on 1.6 community edition? I’m trying to extend the catalog/category api with a new method… I can see the new method in the wsdl but when I try to call it I get an ‘unknown error’ response.